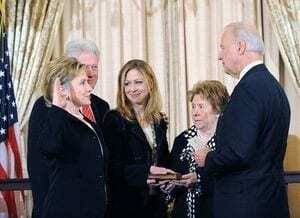 Hillary Clinton’s mother, Dorothy Rodham, has died. Rodham, 92, had been living with the Clintons in New York. The Associated Press reports that Hillary Clinton canceled trips to London and Turkey for international conferences in response to Rodham’s illness. A condolence book will be opened at the Clinton Presidential Center.